Welcome to the new post of Moneyham. As usual we are discussing this time also making free money via online at Dubai.I am going to explain about getting 20Aed free for downloading an app and 20 Aed every time when you refer a new member. Let me introduce you to Melltoo. 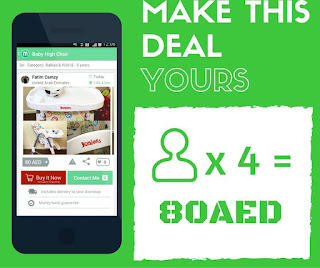 Melltoo is an app that helps people in UAE to buy and sell preloved items. It’s a smartphone version of the classifieds section of a newspaper that combines social networking connectivity. In short Turn your used stuff into cash by listing an ad for FREE! How to make money with Melltoo? You might be thinking where the money making factor in it. Create an account with Melltoo and get your referral link. Every time someone uses your unique referral link to sign up for a new Melltoo account, both you and your friends’ will be credited with 20AED each. Sounds great, isn’t it? All you have to do is share your unique referral link with family and friends via Facebook, email or Twitter. There is no limit to the amount of Melltoo credit you can accumulate. So, get your friends to download and sign up for a Melltoo account using your unique referral link and prepare yourselves. So why are you waiting Get 20 Aed for Free now itself! Great! Melltoo.com is a brilliant way to turn your stuff into cash, safe too! Find out how 1,000's of individuals like YOU are making a LIVING online and are living their dreams TODAY.